Jan Hase is a USPSA competitive action pistol shooter who resides and competes in Oregon. He currently maintains the rank of Master in 3 USPSA divisions. Open, Limited and Production in addition to maintaining a USPSA Chief Range Safety officer certification. 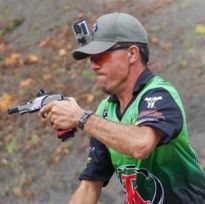 He has aspirations of winning the Area 1 USPSA Championship. In addition to shooting, Jan enjoys various hobbies and spending time shooting with his wife Angelina.